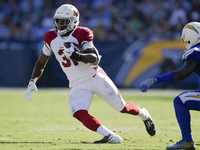 A dreadful 2018 campaign — in terms of individual and team success — certainly has not dimmed David Johnson’s aspirations or excitement for the season ahead. "I’ve talked to guys [who are familiar with Kingsbury’s offense] like [receiver] Christian Kirk and he said a lot of people have heard he doesn’t run the ball, but he told me personally that their running backs have gotten the ball a lot as far as running the ball," Johnson said via the Arizona Republic’s Bob McManaman. "I’ve heard that Kliff is really good at putting his guys in open space, especially as running backs, and giving them open space to try to get the yards catching the ball, and doing things like that." And so Johnson’s largest individual expectation is one he’s had for some time and that’s to join some rarefied company. "My biggest motivation is still 1,000 yards rushing and 1,000 yards receiving," he said. "That’s what I’m always going to try to strive to just because I was so close in 2016. … I think I still have the same mentality of trying to get that." Johnson played only one game in 2017 due to a wrist injury and 2018 was a disaster in the desert as the Cardinals earned the No. 1 overall pick in the 2019 NFL Draft with a 3-13 record. Johnson was smothered all season, racking up but 940 yards on 258 carries — just 3.6 per tote — and had 50 catches for 446 yards. Getting the ball more is something else he’s looking ahead to, though. "My role this upcoming season, from talking to the coaches, is that I’m going to hopefully get the ball a little more," Johnson said. "Really, it’s just how much I can learn and be able to attain with the playbook that’s really going to determine how much I play and how much I do as far as the offense." The addition of Kingsbury and the quandary of whether to retain quarterback Josh Rosen or draft Kyler Murray No. 1 overall have dominated headlines in the offseason. Johnson’s a proven talent, however, and might well be the biggest key to unlocking offensive success in Arizona.